Begin by making lists of the big ideas that you want to include. Create one list of the people, one of events, and one of topics that you want in the book. You don’t need to worry about the order in which you list them or adding any detail to the listing. This is a brainstorming exercise to get you started thinking about the book’s contents. If you think of things that belong on any of the lists later, add them. Think about the scope of your book. One important thing to realize is that while genealogy and family history research may seem infinite, books are finite. There’s a limit to the space in a book. Consider what that limit means for what you will include. For example consider the issue of breadth vs. depth. The further back you go in your family’s history the more individual ancestors you have, but the less detailed your knowledge of these people may be. As you move to within the last three or four generations you have fewer people to deal with but your knowledge of those people is much more detailed. As you reach ancestors of whom you have first-hand knowledge, or can interview older relatives who do, you will probably have more information than you can include. You’ll have to decide which stories are the best and include only those. So the choice you should consider is how to limit what you will include. Do you limit by including only four or five generations, or do you deal with only one family line in this book and leave another line for another book? Next, take inventory of what you have – fact from the vital records, stories about individual ancestors, family legend and lore, photographs, documents, pedigree charts or family group sheets – which you might want to include. A simple chart (see illustration) will help you to do this. Go back to your lists of big ideas and include the people, events and topics on your list, then fill into the chart. Notice that you begin to match stories and information with documents and photos you may want to use as illustrations. With your list, inventory and thoughts on the book’s scope and style begin to create an. This is not the kind of outline you made in junior high school. You don’t have to worry about getting the Roman numerals and capital letters right. What you do want is to decide on the most important categories to include and the subcategories you want to deal with in each one. A good outline will eventually turn into your book’s table of contents. Most people begin with a chronological plan to organize their book outline, but you might want to consider alternatives at this point. Do you want to use biographical sketches of ancestors within a chronological framework? 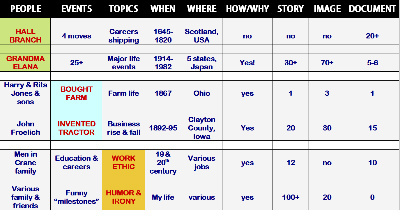 When you took inventory did certain themes or topics stand out – entrepreneurship, community service, patriotism and military service, pioneering, etc. Are certain values evident in the lives of multiple ancestors? If so a topical organization might work best. Many good family histories are hybrids which incorporate more than one approach. Creating a good plan for your book will keep you on track, save you time and allow you to concentrate on telling your ancestors’ stories well as you begin to write. You’ll like the results.